Did you see the Giant Turtle I posted yesterday on my facebook page? If you didn’t get to catch it on facebook, here’s a picture of when we walked up to him/her (sorry I’m not a turtle biologist). We brought him to Rocky Pond, and although he wasn’t too lively when we first found him, he was energetic by the time we had arrived. I said “Bruce Willis” thinking of the Die Hard series. Bruce Willis then swam off into the distance. He even waved good bye to us with his tail before diving. So what can we learn from Bruce Willis with the Cigar in his mouth? I look at stress in a few ways. Controlled stress – stress that you put on yourself, and Reactive Stress – stress that “happens” to you. An example of Controlled Stress would be when you challenge yourself. For example, “Tomorrow I’m going to wake up at 5am” would be an example of controlled stress. You are breaking your norm to challenge yourself. 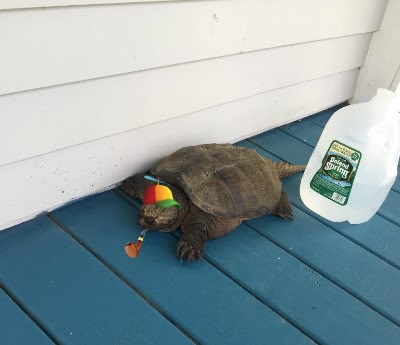 An example of Reactive Stress would be when a turtle shows up on your door step and you need to save him. We have both of these types stresses in our lives. Most of us would prefer the Controlled Stress… because we put it on ourselves at a time convenient for us. The reactive stress can pop up out of no where and throw your day for a loop. Here’s what I like to do. There’s something so fun about putting out fires (reactive). It keeps you on your toes. It keeps your mind sharp, and when you figure out that problem, you feel invincible. On the flip side, if too many of these things happen, you can sometimes get off track from your daily mission, and all the things you wanted to get done just don’t happen. Controlled Stress is great because you have complete control. It empowers you to set your day up how you please. However, if we just had this all the time with no fires, it might be hard to get motivated. I find my controlled stress time (planned activities) are geared to help prevent fires. So how do we manage these two things alongside each other, since we need both to be at our best? I love to start my day off with a routine, where I get the most important tasks of the day done when I’m most fresh. I prevent as many “reactive” stresses by staying away from my phone and facebook as much as possible. I also try to isolate myself from other humans at this time. After the morning, I’m ready to go. I feel like a hundred bucks because I got all of the most important stuff out of the way. I’m ready to take on some fires. I head into the office, and look for opportunities. After I deal with those fires for that day, I make a note, and my new morning projects go towards creating a system that can prevent that fire from happening next time. Maybe you’re a mother or a father who has everything in the morning dedicated to your kids (getting ready for school, getting day started, etc) and then after you go to work. You have a few options! One, you could get up earlier, or two, you just schedule your controlled time to later in the day! Writing Newsletter, Working out, Prepping and cooking food, Grocery Shopping, Yoga, Reading, Gratitude Journal, Goal Journal, Shower, etc. I look at all of these items as investments in myself. Answering the Phone, Making phone calls, answering email, meetings, going to work or office, networking, being with kids (although I may look at this differently when I’m a parent), etc. These items are investments in other people. Set some time aside during your day for your controlled stress activities to invest in yourself and give yourself that time you need. After that, you’ll be ready to go for your reactive tasks which will allow you to work with others and take on the awesome problems for that day! I hope this helps! Have a great Monday!